Calvin and his friend Josh have been hounding me to climb Mt. Baker this summer; so this week Markus joined us as we made the ascent. The 'partly cloudy' Thursday forecast turned to a light drizzle and dark clouds as we approached the trailhead. We contemplated postponing for a day but the forest service office encouraged us to go ahead since it would clear up in time for our morning ascent, We met a few climbers coming down who had horror stories of their morning summit - high winds and ice pellets. We continued on with the hopes of clear skies by midnight. We hiked through the fog to the high camp at Black Buttes. It was cold, cloudy and windy so we took care of dinner and essentials and then spent the evening in the tents, Unfortunately, I only slept for fifteen minutes before our two o'clock wake up. We woke to a clear blanket of stars and a towering summit. With head lamps and rope we headed up. As we made our way up we enjoyed stars, sunrise, views and a towering mountain. The final hour was extremely exhausting. We arrived on the summit at 8 am, the first party of the day. It was cold and windy but the views were amazing! The long hike back to the trailhead was agonizing, but we were glad we had the summit over as we met crowds of climbers heading up for the next day's summit. We are thankful for a safe trip and great weather. This was my third ascent of the mountain and my body is telling me it should be the last. Good work, old man. I didn't know you had it in you. I am very proud to say I teach with a mountain climber. I am so very jealous! Way to go! 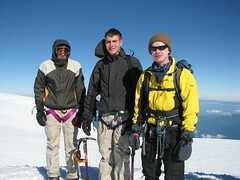 I hope to climb baker some day as well as Ranier. We have been going on short hikes with olen as there are trails that start from our condo. Also after years of reading your blog I have started one of my own. the address is Lucasinbigsky.blogspot.com. Hope your summer is going great!